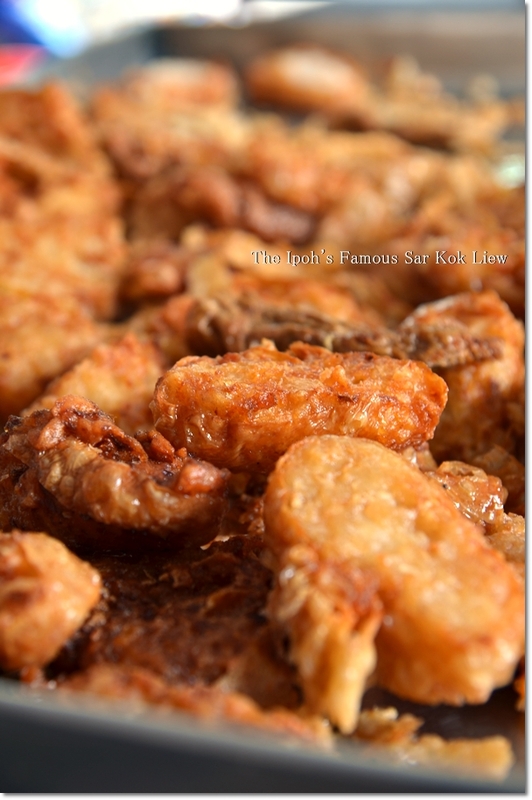 Sar Kok Liew (Stuffed yambean/jicama) has been featured on this blog countless times before. But if you have not been enamoured by the droolworthy stories, what’s holding you back? I remember how we used to look forward to Chinese New Year back when we were kids. And slightly beyond the age of toddlers; bordering on being adolescents. The moments when we would happily shopped for new clothes (Kiko, Kiki-Lala, and even the random Thundercats shirts from the morning market!) and shoes (always with velcro, since I was pretty bad at tying knots with shoe laces). Then the sheer joy of eating the festive cookies; of which most notably … the Kuih Kapit (“love letters”; a crispy biscuit folded into a fan-like shape made from a batter of eggs and coconut milk) comes to mind. A refreshed touch of glam in the coat of purple paint. Where is this, you asked? Old town of Ipoh. As in the oldest portion of the vicinity, I reckon. Painting a picture of serenity; the dalmation was having a really good time; in her best siesta moment. The crowd were jostling for … bags?! And the lady in the top right picture was nicked “Ah Tor” (elder aunt, or something) whom used to operate a beverage stall but no longer able to now. After prior reservations have been made, we would always followed our parents to old town at night (since the vicinity can be really crowded during day time, like it still is now) to collect the tins of ‘kuih kapit’. There, we would bear witness to the whole laborious process of making the festive delights; a team running the show with clockwork precision. One would be slaving it off around the charcoal-fuelled fire and continuously flipping the mould shaped like a pair tongs sandwiching the batter within. Then without much charring, the roasting process would end and automatically there would be another person with deft pair of hands; withstanding the heat and folding the biscuit in a hasty manner; before leaving it to cool. Then, another team member would gently placed the biscuits into an empty container; usually Milo tins, before sealing the filled container and voila! The “kuih kapit” is ready for purchase. Located within the same row would be this Seng Kee (Seong Kee in Chinese, if I am not mistaken) stall whole-selling pieces of freshly-fried goodies. 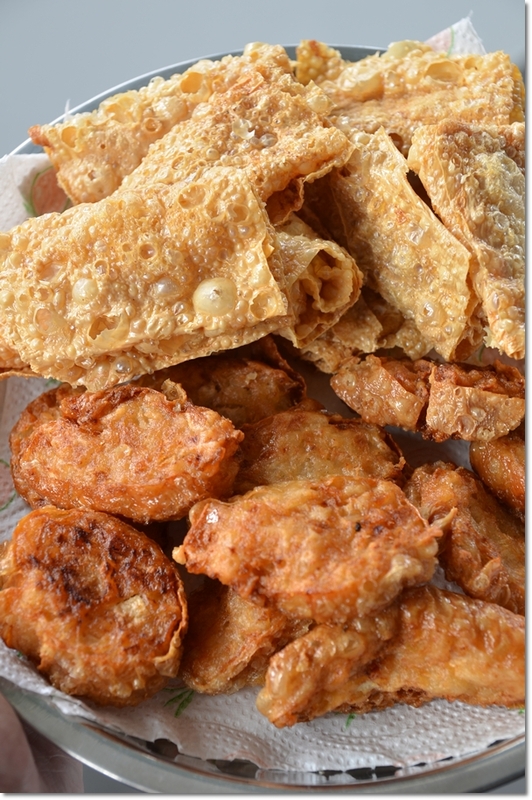 From fish cakes to ‘sar kok liew’ and rolled up beancurd sheets to other crispy delights. At only RM0.30/USD0.10 per piece, are you in disbelief? However, the ladies no longer make “kuih kapit” for sale. A heart-wrenching note, since we have abstained from buying these for a few years now, and they stopped making them not too long ago. So there goes the memories. 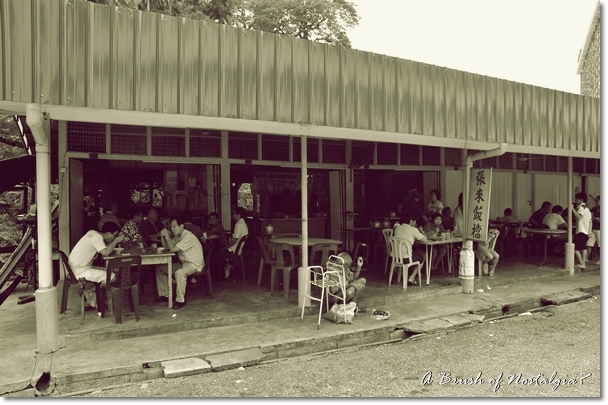 She still sells fish ball noodles for breakfast-late lunch, but the memories of the family diligently burning the midnight oil making tins after tins of “kuih kapit” still holds a very strong impression in my heart. I guess, we have to make do with another supplier this year. After several years of buying from one in Kampar; albeit not the same “Kuih Kapit” material. Those are thicker layers of egg-enriched biscuits shaped like a fan too; we call them “Gai Dan Peng” or Egg Biscuits. I believe these would do just as well; in case the craving for good old Ipoh style “Fried Liew” comes into mind. 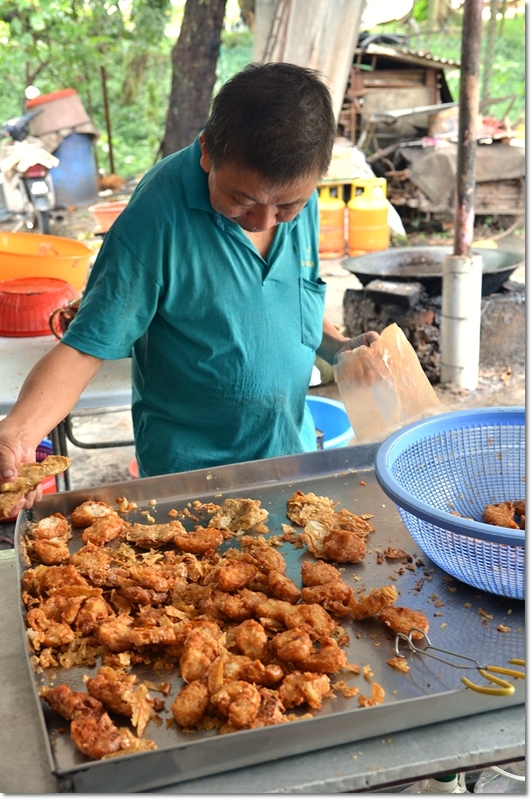 The man selling the fresh-from-the-wok fried pieces of “yeong liew” (stuffed ingredients) is still at it after years in business. They do wholesale to other smaller coffee shops and traders, hence if you’re buying from here, a piece will only cost you 30 cents. Yes, 30 cents. When you can barely buy a glass of Chinese tea or even warm water now with that amount. The clams (la la) are good, done either by steaming or stir-fried with ginger. The black pomfret with preserved vegetables sounded lovely too, while the thought of leeks and roasted pork crossed my euphoric mind. Oh, they do braised meats as well; and the braised skin from the pig’s head in soy sauce can only mean … copious amount of steamed rice! Finally, after what seemed like aeons of anticipation, here’s an updated shot of Lulu …. 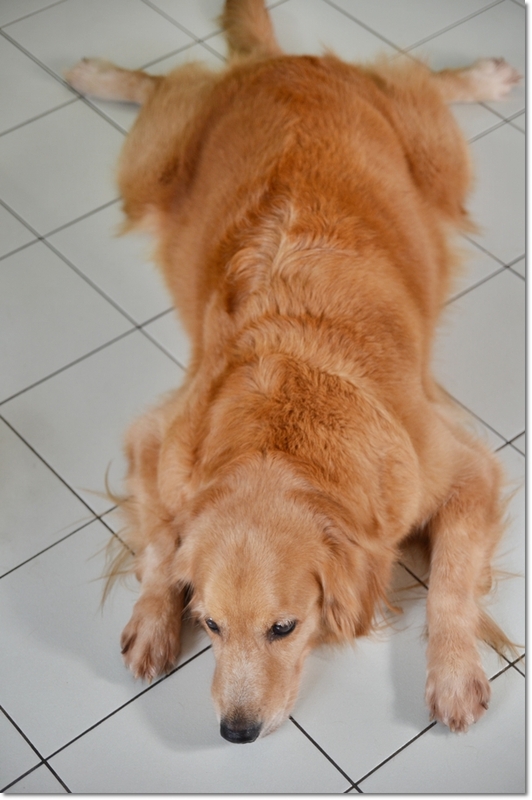 a Golden Retriever with a strong penchant to EAT. SLEEP. And BE MERRY. Wait, how come those passions sounded familiar? Just turn towards Jalan Bijeh Timah from Jalan Sultan Iskandar (Hugh Low Street); ie the first turning on the left after the bridge over Kinta river. You will pass by rows of shops on your left, and various sundry shops and wholesalers for dried food products on your right. 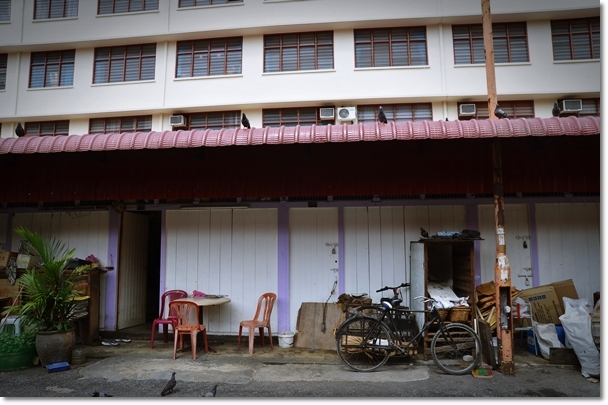 Once you see a row of three-storey flats with eateries and shops (even a Klinik Kesihatan Bijeh Timah) on the ground floor, look for a sign that reads “Pasar Jalan Patrick” in green. Turn left into the opening and you will find the shops mentioned in this post beyond the archway. Never tried the Sar Kok Liew before but I loceee Jeong Loi! what makes me remember it vividly is that my dad used to order the dishes by following what the chef was cooking at the moment. so we did not know what dishes would be served but definitely those food were scrumptious! Oh… eating whatever’s the freshest and best for the day? Interesting. I wonder do they do that anymore nowadays. I did spy a few huge containers of food but not sure what’s in them. 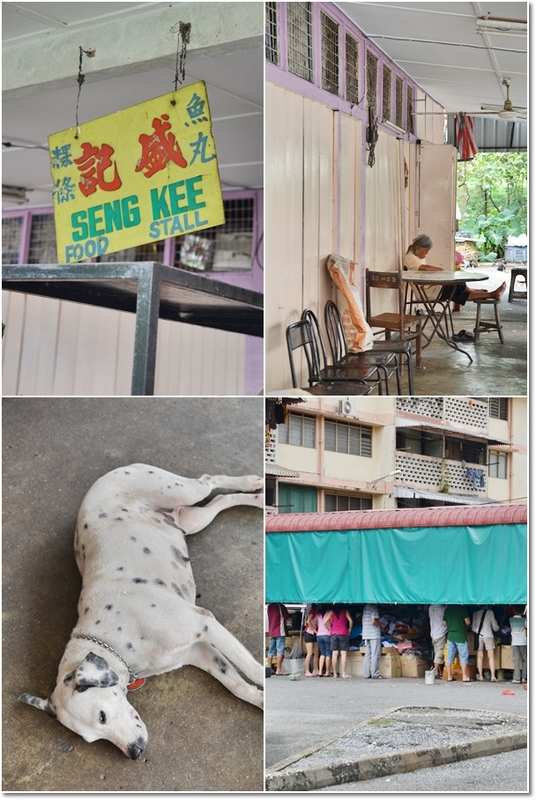 I loved the sar kot liew, they looked so delicious but I loved your dog even more, she is simply gorgeous, just look at her two hind legs! Not that I’m complaining, but sluggish loading instances times will sometimes affect your placement in google and can damage your high quality score if ads and marketing with Adwords. Well I am adding this RSS to my e-mail and can look out for a lot more of your respective fascinating content. Ensure that you update this again very soon.